These plyometric workouts are specifically designed to help you get more distance out of your shots. 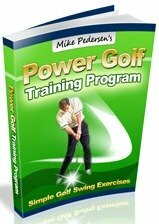 The two main components that you need to improve are power and golf swing speed. This page will provide you with exercises and tips for helping you further progress your golf fitness program. Working on golf specific power should be one of the final components of your training program. Before beginning these types of exercises, you should already have developed a solid base through general stabilization and strengthening exercises. This way, your body is properly training to handle the rigors of these more advanced, plyometric workouts. It is highly recommended that you do not immediately dive in to these exercises without properly preparing yourself first! They are not for beginners! So what is increasing power so important? First, increasing your power will lead to higher club head speeds through impact. Increased swing speeds have been correlated with lower handicaps! Also, a higher golf swing speed will lead to longer shots, and that is what everyone wants! The ability to crush your drives past all of your buddies is one of the best feelings you can get on the course. Leave them all yards behind by adding power based exercises to your training program! The basic idea behind plyometrics is to develop power through rapid muscle contractions. This type of training is helpful for athletes because the exercises can be tailored to sport specific motions in order to optimize performance. In terms of golf, this includes rotation motions which will help develop power for your down swing. Plyometrics try to optimize what is referred to as the stretch-shortening cycle (SSC). The SSC is when a muscle "coils" up and than rapidly bursts out to perform a motion. For the golf swing, a great example is the transition from the back swing to the down swing. A proper back swing allows your muscles to coil, and store energy. This energy can then be quickly released in the form of the down swing leading to impact with the ball. Another example would be jumping. Your quadriceps "stretch" when you squat slightly prior to jumping, and then they rapidly "shorten" once you explode up and actually jump. Making this system work as efficiently as possible through training will have huge implications on your golf game! Remember, these plyometric workouts are intended to be performed quickly and with large amounts of force. A couple sets of 8-10 repetitions each should be enough. -Handle should be approx. between waist and chest level. The main thing to remember with these types of rotation exercises is that you want the motion to come from your midsection, and not too much from your hips or arms. It can be very easy to cheat! -Grab the handle with both hands, and stand with feet about shoulder width apart. -Rapidly and forcefully rotate at your waist away from the machine. Repeat to the other side. -Similar to the standard rotations, but either start high on the cable column and rotate down and away, or start low and rotate up and away. -Holding a medicine ball with both hands, stand so that your right side is facing either a partner/wall/upright trampoline. -Quickly rotate at your waist and throw that ball to the right from around waist level. -Once finished, repeat to the other side. -Stand facing a partner or wall. -Lift the ball up and behind your head, and then quickly throw the ball towards the target (think of a soccer throw in). -Assume your golf stance, either holding a medicine ball or a kettlebell by the base with both hands. -Swing the weight from side to side, in a form similar to that of a golf swing. -Focus on the transitions of the swing (back swing to down swing, for example), and remember to be forceful. -A traditional plyometric workout for the legs. Stand facing a box or exercise bench. Any height from 6 inches and up will work good depending on your skill level. -Perform a small squat and then explode up, jumping and landing softly on top of the box.